We can quickly and efficiently assess the condition of any renewable energy system with our test equipment and years of experience, and provide a detailed report about what's right and what's wrong and then what needs to be done to fix any problems. 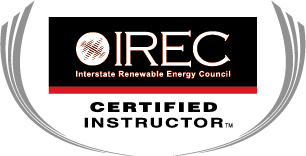 We have developed a special 1-hour class on off-grid for home inspectors, which has been presented to local chapters of the American Society of Home Inspectors (ASHI). Contact us if your organization is interested in this class. We provide post-disaster inspections to determine if wiring or equipment has been damaged and if it is still safe. We were extremely busy with these inspections here in Colorado after the 2012 fires and 2013 floods. We provide professional, expert documentation for insurance and FEMA claims. You never know what might be lurking in the renewable energy power system of the home you just bought or are considering buying...call us first for an inspection before you pull out your wallet. A solar / wind power system might be an asset, or a serious liability! The system shown here has major safety issues. Note the electrical code book-- it has obviously not been opened or read for a long time.